At Champion Powder Coating we pride ourselves on using the industries highest quality materials and equipment to deliver the best possible results for our customers. Our promise is to deliver the highest quality results while keeping turn around times low. To do this we have expanded to 20,000 square feet and are equipped with multiple media blasting, powder and paint spray booths. Do you have a big job that needs done fast? Give us a call! We only use the highest quality materials from the biggest names in the Powder Coating industry. With 1000's of different colors and styles, ranging from candies to textures and everything in between, we will help you bring your customers vision to life! If you have any questions or need color matching, give us a call or stop by and we will make sure your customers will get the finish they deserve. Check out our powder supplies below to see a sample of our color options. Sandblasting is the most common form of media blasting, you are essentially using compressed air and sand to strip the metals clean and give it the profile the powder needs to stick. If you have ever used sandpaper, it is essentially the same idea. Although sand is the most common, everything from glass, to steel and walnut shells are used for all kinds of different substrates. Everything from wood to glass and plastic can be media blasted, depending on what media you use. surface preparation prior to painting, bonding or other coating operations. removal of rust, scale, sand, or paint from fabricated components. roughening of industrial gas turbine engine component surfaces in preparation for thermal spray coating. removal of burrs or edge profiling machined components. providing a matte cosmetic surface finish on consumer products. removal of mold flash from plastic components. surface texturing of tooling, and molds to alter the appearance of molded or stamped products. Cerakote is a Polymer-Ceramic Composite coating that can be applied to metals, plastics, polymers and wood. The unique formulation used for Cerakote ceramic coating enhances a number of physical performance properties including abrasion/wear resistance, corrosion resistance, chemical resistance, impact strength, and hardness. 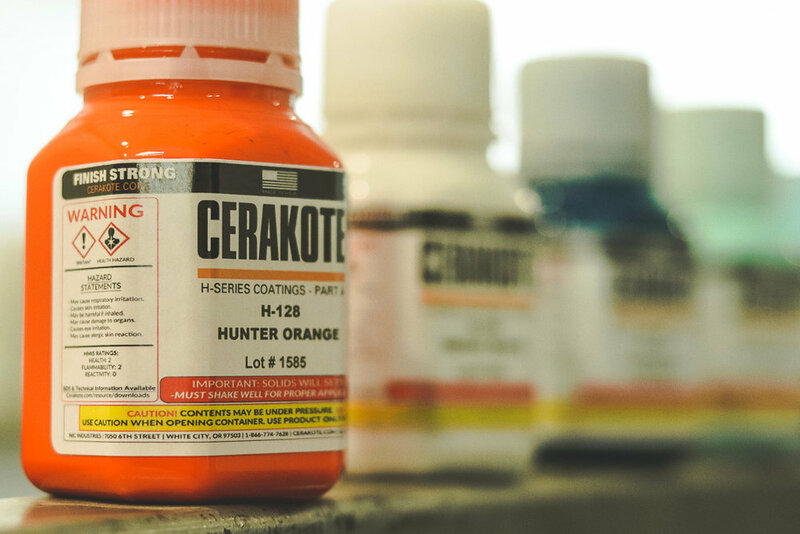 Each of these properties are rigorously tested to guarantee that Cerakote products remain at the forefront of the ceramic coatings market. 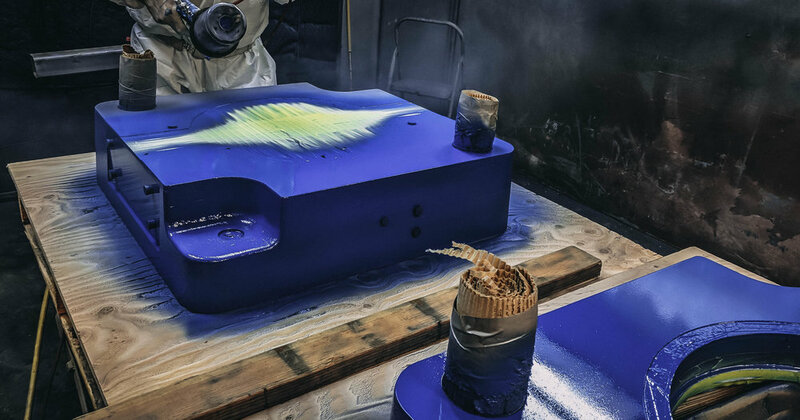 Different Inks can be used to work with a variety of different materials, some popular ones include ceramics, wood, paper, glass, metal, electronics(circuit board printing) and plastics. As a result screen printing can be used in many different industries. A white Industrial epoxy ink printed on top of a black texture powder. Often parts need protection and color, but cannot have the mil thickness that powder provides, our painting services come into play! Industrial painting is one of our many services for the manufacturing world. We specialize in the needs of manufacturers and their precisely made parts. Whatever your customers require, we have the experience to deliver the quality and results your customers expect.